I am in New York City for the Intellectual Property Owners Association’s (“IPO”) Annual Meeting. I have been to the Annual Meeting before in other cities and had a great time, but was thrilled when I heard that it was going to be in NYC in 2016. Even though I live in Boston, I love New York and visit often. There are so many iconic things to see in New York, and numerous symbols that represent the city, from a big red apple, to the Empire State Building and the Brooklyn Bridge. The list goes on. Even if you’ve never been there, when you see these images, you instantly think of New York. But one iconic symbol created in the 1970s is perhaps best known of all. Just as it is for countless millions of people around the world, when I see or even hear the words “I Love New York” one image comes to mind. The configuration of the letters “I” and “NY” in a font reminiscent of a classic typewriter with a red Valentine’s heart between them (either in block formation as pictured above, or on one line) is simple yet striking and incredibly memorable. If I hadn’t included an image, I bet you would have pictured it anyway. Indeed, the “I Love New York” logo design is so ubiquitous that many believe it resides squarely in the public domain. This is not the case. In fact, it’s a registered trademark owned by the New York State Department of Economic Development. More on that later. First, let’s explore the history of the logo that, along with legendary television commercials and an unmistakable jingle, formed one of the most successful ad campaigns in modern history that, quite literally, rebranded the city that doesn’t sleep. The “I Love New York” logo was designed by Milton Glaser (b. 1929), a legendary graphic designer. If you don’t know his name, you surely know his work. He also designed the Barron’s Books logo, the iconic D.C. Comics logo, and the famous psychedelic silhouette of songwriter/singer Bob Dylan, among many others. Mr. Glaser has been so influential that many of his works are in the permanent collection of New York’s Museum of Modern Art (“MoMA”), including a final version of the “I Love New York” logo (1977) and Mr. Glaser’s original concept sketch (1976). In fact, I was at the MoMA last night for the IPO dinner reception, but unfortunately didn’t get to see these works because they are not currently on display. I would have loved to take a picture, which may or may not have been a good idea according to my colleague Jenevieve Maerker’s recent post on museum copyrights. It is hard to imagine now, but in the early to mid-1970s, New York City was in a deep state of decline. New York State was virtually bankrupt, resulting in the disruption of a number of services in New York City, including school closures and cuts to the police force. Crime was on a steady rise, the Son of Sam murders were splashed across national headlines, and the city was generally seen as corrupt and unsafe. 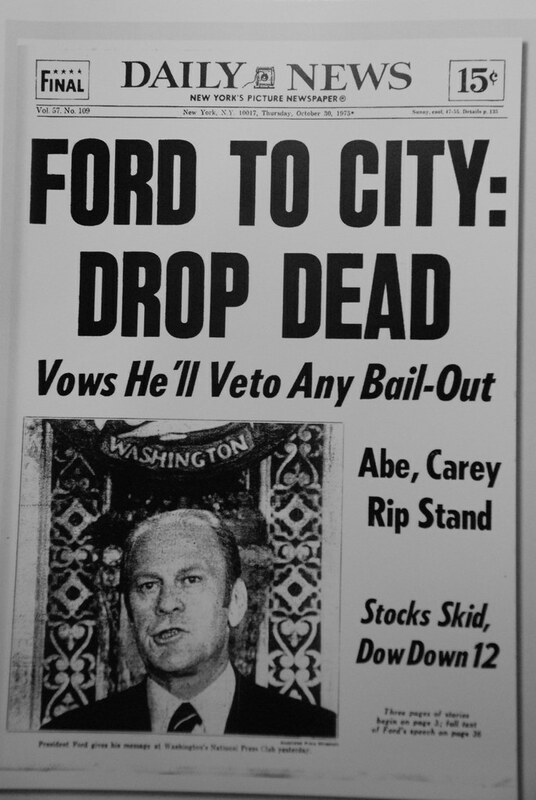 Even President Ford seemed to wash his hands of New York, vowing to veto any bailout approved by Congress. In a truly unfortunate turn of events, New York garbage collectors went on strike in 1975, so the city literally stank. New York was in need of a makeover and increased tourism seemed like the best, last-ditch effort. With nowhere else to turn, New York hired an advertising agency. If you were around in the late 70s and early 80s and had a TV, it was hard to miss the “I Love New York” ad campaign. It beckoned tourists to visit New York and included commercials like this one featuring opera star and native New Yorker Beverly Sills and Tony-winning Broadway stars like Patti LuPone, Angela Lansbury, and Nell Carter (a personal favorite). The television commercials, with their surprisingly catchy 4-note jingle, began airing before the “I Love New York” logo was finalized, but it found its way into later spots. I couldn’t wait to go (I wanted to see Sweeny Todd!) and New York really needed the tourists. The results? To say that the “I Love New York” campaign was an unmitigated success is an understatement. New York tourism boomed. People from all over the country and from around the world went there, did many things, and definitely bought the t-shirt. The city snapped back in a big way, and the logo and ad campaign became part of the zeitgeist. Saturday Night Live even spoofed the ads in an “I Love Sodom” sketch (which is still funny), resulting in a copyright infringement suit for unauthorized use of the jingle. The court, it turned out, was in on the joke, and found that SNL’s skit was a fair-use parody. I love fair use, but in case there is any doubt, the “I Love New York” logo is a registered trademark and this blog post is not approved, endorsed, or in any way affiliated with its owner, the New York State Department of Economic Development, or with the IPO or MoMA.